In this video we discuss the unique and beautiful look of a cedar privacy fence. A cedar privacy fence adds warmth and visual appeal to your property. Check out the video to learn more. Traditional cedar fences or pressure treated fences are often built with their fence boards running vertical. For our cedar privacy fence we install our fence boards horizontally. Horizontal fence boards are key to a cedar fence. This board placement gives your fence a semi transparent look that keeps your landscape backdrop looking light and open. Traditional vertical fence boards can feel more wall like and less visually attractive. The cost for installation of this fence will be higher than a traditional fence as the there is more labour involved with this kind of fence project. This style of fence is a great addition to your modern landscaping project. 4 x 6 fence posts are best for a solid fence. 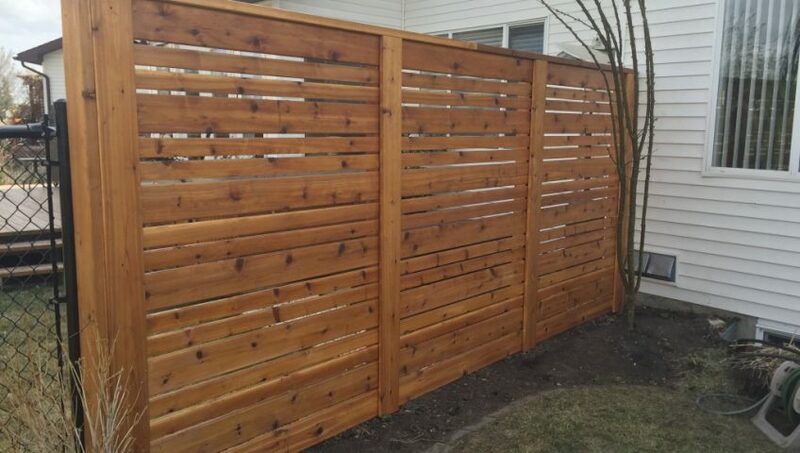 Using 4 x 6 or even 6 x 6 fence boards for your cedar privacy fence will help give your fence the strength it need to withstand our freeze and thaw temperatures here in Calgary. Many contractors or homeowners use 4 x 4 posts to build their fences. The fence post is the spine of your fence and therefore a 4 x 4 post will not be adequate. We have replaced many fences with 4 x 6 or 6 x 6 fence posts because they were leaning or falling over. Along with the fence post it is important to add at least two bags of concrete. We are often called to repair gates installed by other contractors. The number one issue with their gates is the quality of their gate hardware. Flimsy hinges and latches have to carry the load of a very heavy gate and they will not withstand the stress over time. Using heavy duty gate hardware is a necessity if you want your gate to stay in position and open and close easily. If you are going to spend the money on a beautiful fence it is well worth it to spend a few more dollars for proper gate fixtures. Semi transparent stain is the best stain to use when staining your cedar privacy fence. There is enough protective coating to give your fence protection against the sun but at the same time it still shows off the natural wood grain of your cedar privacy fence. A cedar privacy fence is one of the most additions you can make to your Calgary landscaping. To keep it looking great make sure to stain your fence annually. There are many styles of fence and deck products to choose from. Check out our fences and decks page for more.